Continuing Education and Training (CET) helps working adults to keep their skills relevant and to upgrade their skills amidst rapid technological advances and shifts in the economic landscape. Continuing Education and Training (CET) helps working adults to keep their skills relevant and to upgrade their skills amidst rapid technological advances and shifts in the economic landscape. CET also helps to address manpower and skills gaps in Singapore to support industry development and job creation. The objective of the project was to develop a centralized and one stop portal to aggregate the various academic CET courses provided by the tertiary institutions in Singapore. Our Project Management team was instrumental in coordinating with the various institutes to determine user requirements and to establish a common structure that caters to the functional workflows, processes and key attributes of the various institutions. The portal was designed with a user friendly interface to allow the target audience (fresh graduates and those already in the workforce) to narrow their searches using filters such as field of interest, Institution and educational qualification. 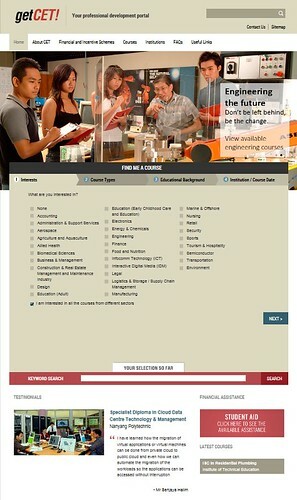 Users are then allowed to select up to 3 different courses to compare against each other. The system will display information such as course introduction, mode of training, industry, entry requirements and course fees in a tabulated format to facilitate comparison. Users can then register their interest in the course of their choice by filling up an online form. The site also provides information on financial assistance and subsidies available.